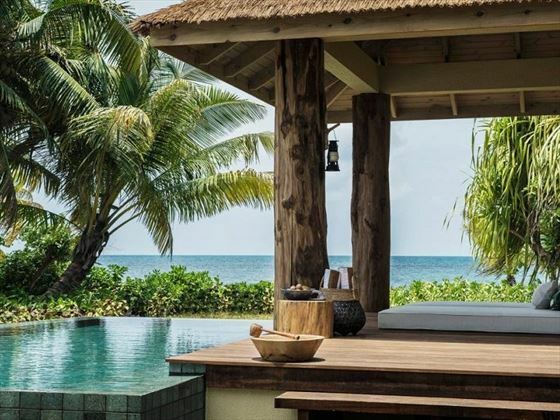 Encircled by jaw-dropping pearly beaches and gem-stone blue sea, Four Seasons Resort Seychelles at Desroches Island boasts a divine location straight out of your Indian Ocean fantasies. 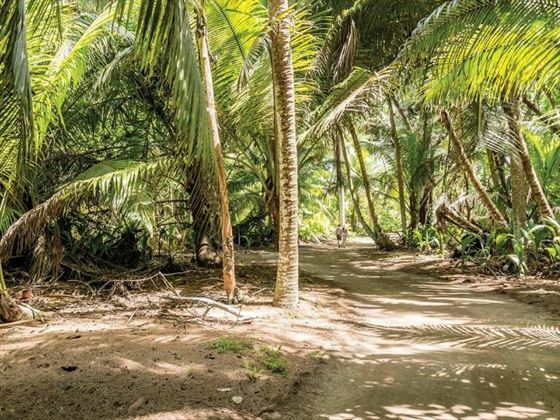 We find this secluded oasis to be perfect for families - its location in the Outer Islands evokes a castaway feel, but a direct flight from Mahe creates ease for those who don't wish to venture too far. 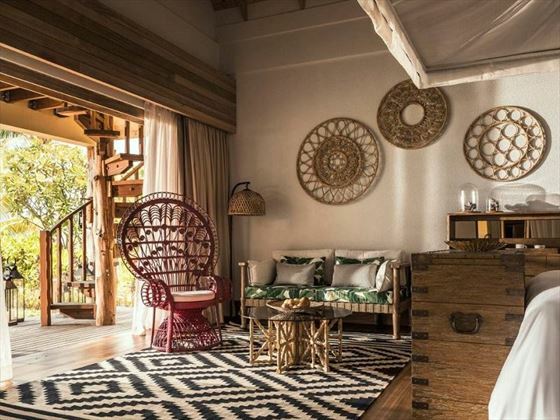 There are just 71 gorgeous villas, suites, bungalows and residences altogether. 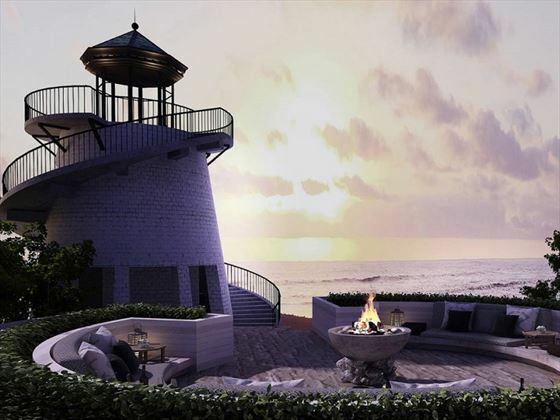 All boasting a private pool and beach access, each category is blessed with luxurious amenities, and all have their own unique perks. We love how the resort uses natural resources to decorate each accommodation, including collectibles from the sea trading route. The gorgeous coastal waters are home to a stunning coral reef, making this a fantastic location for snorkelling and diving. 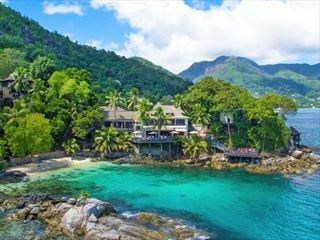 There’s even a scuba dive centre on-site, meaning you can get accredited during your stay and enjoy some of the most wonderful underwater scenery anywhere in the world. If you’re bringing children, they’ll love the Kids For All Seasons club, which offers a range of supervised activities for youngsters, giving you some time to treat yourself to some quiet relaxation safe in the knowledge that they’re having the time of their lives. This idyllic retreat is perfect for couples, too. 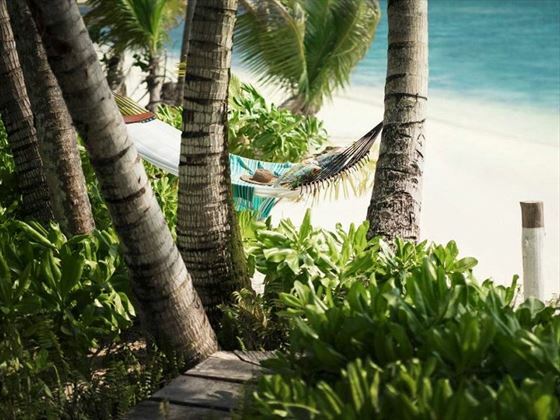 Venture along to the Spa at Four Seasons Resort Seychelles at Desroches Island for a rejuvenating treatment created with organic ingredients, read a book side by side along the sugary sand beach, and dine on sensational fresh seafood by candlelight at The Lighthouse. Absolute bliss. 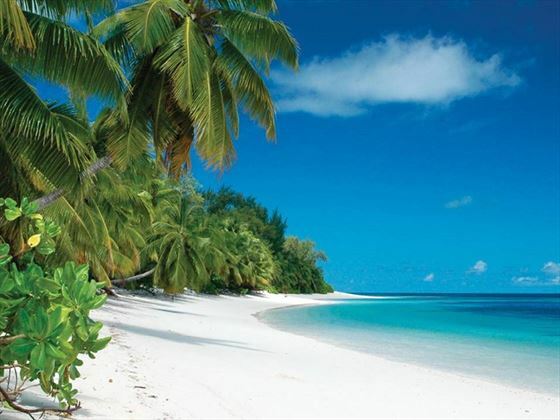 Sitting on the stunning Desroches Island in the Outer Islands archipelago, the resort enjoys a truly superb location. 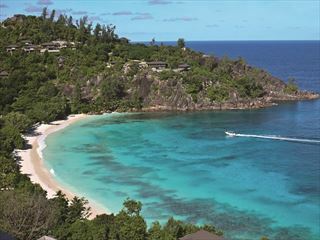 It is the only resort on the island, enjoying a luxurious and secluded feel. Beach Bungalow - These picturesque bungalows are only a few steps away from the powdery white sands. 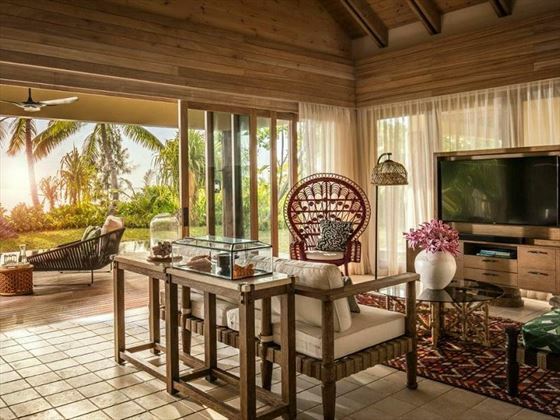 Featuring a furnished terrace, indoor and outdoor showers, a private plunge pool, and partial ocean views. Sleeps a maximum of two adults. Sunset Beach Suite - Located on Sunset Beach - on the west side of the island - these suites boast wonderful views of the ocean. The direct access to the beach from your private garden is perfect for young children looking to splash in the sea, whilst the outdoor terrace, hammock and pool cabana offer shady spots to relax. Sleeps two adults, or two adults and two children. 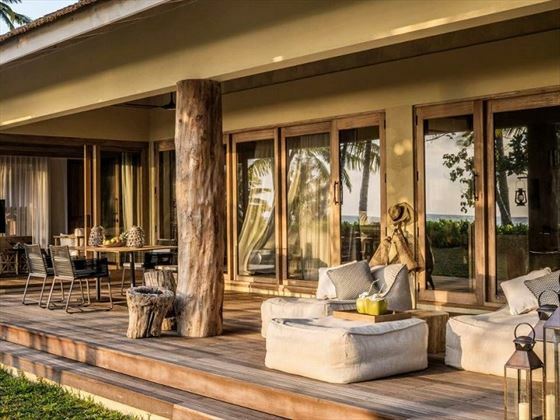 Desroches Suite - Also nestled along Sunset Beach, these suites boast sensational Indian Ocean and sunset views, featuring two ensuite bedrooms, a choice of lounge areas, three private terraces, a tropical garden, and a private pool. Sleeps a maximum of four adults and two children. 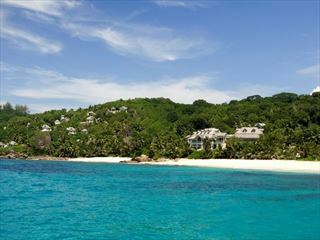 Coral Beach Villa - Lying along the south side of the island on Coral Beach, these spacious villas feel very secluded. Boasting lovely ocean views, a private pool with a cabana, a hammock tied to two soaring palm trees, a hidden garden, and an outdoor shower. Sleeps up to two adults and one infant. Sunset Beach Villa - Found on Sunset Beach, the views of the sunset are incredible - best viewed from the secluded upper balcony. 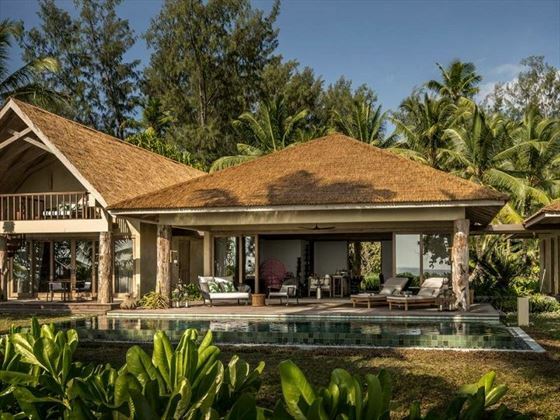 These villas also enjoy an open-plan bedroom and lounge, a private garden, an expansive pool, an ocean view dining area, and a hammock. Sleeps two adults, or two adults and one infant. Two Bedroom Villa - Tucked away on the north side of the island, these villas have partial ocean views. 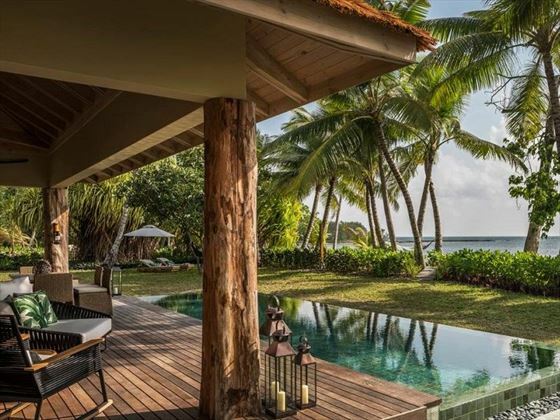 These villas are ideal for families, featuring two bedrooms, a open-plan lounge, a poolside terrace for al fresco dining, a private pool, an outdoor deep soaking tub or outdoor shower, a bike for every guest, and butler service. Sleeps four adults, or two adults and two children. Three Bedroom Presidential Villa - Sophisticated villas found on the north side of the island, perfect for large groups. 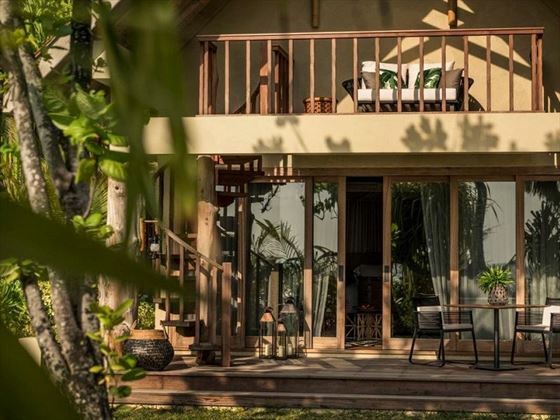 The huge garden and pool is the main focus for this retreat, featuring three bedrooms, a poolside terrace for dining under the stars, butler service, and bikes for every guests. Sleeps up to eight guests, including up to four children. Seven Bedroom Presidential Villa - Again found on the northern beach, this is a truly luxurious villa. Each of the spacious bedrooms have their own bathroom with an indoor and outdoor shower. There's also three swimming pools, homely living and dining areas, a fully equipped kitchen, a pool deck and an outdoor barbecue pit. Guests will also benefit from butler service throughout, and bikes for every guest. Sleeps a maximum of 16, including eight children. Three Bedroom Residence Villa - This northern-side villa is great for families, with an open-plan kitchen and family dining area, huge outdoor and indoor living areas, three bedrooms, and an outdoor pool and garden. You'll also be treated to complimentary bikes and butler service. Sleeps up to six guests, including three children. Four Bedroom Residence Villa - Relaxing and welcoming villas, boasting four bedrooms with ensuite bathrooms, a large kitchen and family dining area, extensive outdoor and indoor lounge spaces, a private pool and garden, bikes, and butler service. Hosts up to eight people, including up to four children. Five Bedroom Residence Villa - Gorgeous villas with partial ocean views, featuring five bedrooms - all with their own indoor and outdoor showers and deep soaking tub, open-air living and dining areas, a private pool and garden for al fresco dinners, complimentary bikes, and butler service. Claudine - A truly inviting Mediterranean restaurant, combining delicious flavours from Greece, Spain, Italy and Portugal. 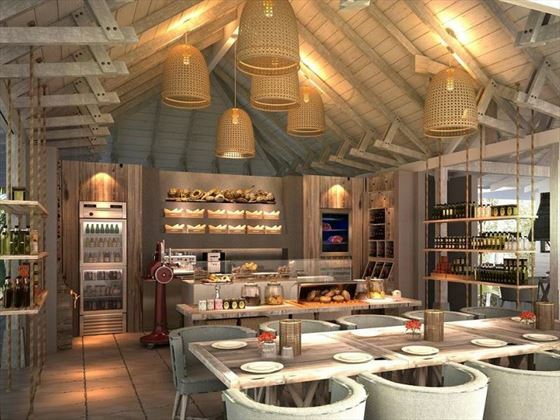 You'll love the chilled vibe here, juxtaposed by the bustling open kitchen. Children's menus are available, and reservations are recommended. Dress Code: Casual during the day, smart casual at night. The Deli - A picturesque deli serving up flavourful yet simple dishes, perfect for a quick breakfast or to create your own artisan picnic lunch. Dress code is casual, but with only 10 seats this is more of a grab-and-go eatery. The Lighthouse - Housed in a building inspired by quaint lighthouses, this restaurant boasts a divine menu of freshly caught seafood and a sensational raw bar. Relaxed yet refined, this is perfect for a romantic evening. Dress code is smart casual, and reservations are recommended. The Bar - Found poolside, this welcoming bar offers an extensive list of punchy cocktails, wine and beer, all paired with tasty Creole tapas, cigars and shisha. In-Villa Dining - From an indulgent breakfast in bed to a quick lunch for the family, in-villa dining is available 24 hours a day. Those staying in Residences can even order groceries, based on a selected menu. Got a special occasion? We'd recommend treating yourself to a private chef. This fantastic tropical kid's club is perfect for kids who fancy making new friends and living like an island explorer. Days will be spent partaking in activities in the outdoor playground, play pavilion, and air-conditioned relaxation rooms. Available for children aged 4-12 years, and open 9am-5pm. Located on Sunset Beach, this is a chilled spot for teens to hang out together and take part in table tennis, computer games, and beach volleyball.